I originally created this recipe as a results-driven detox/cleanse program. Our clients needed something to sustain them through a morning of exercise that was satisfying and energizing, and these protein-packed bars fit the bill. They are perfect now with summer winding down and kids going back to school. 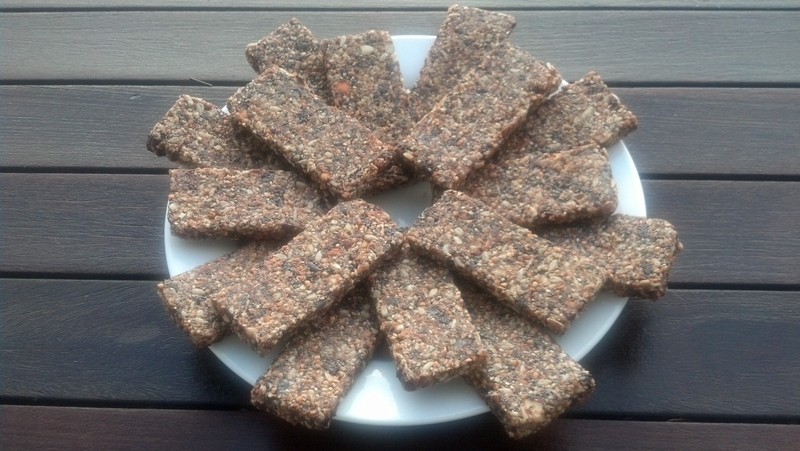 Nourishing, portable and easy to make, this raw granola bar recipe provides a great template for experimenting with additional flavor combinations. For breakfast balance the granola bars out with a green juice or smoothie. Keep one on hand for a mid-morning snack or a lunch box option. 1Cover almonds and dates with warm water in a medium bowl and soak for 1-2 hours. 2Grease 9”x11” baking dish or ¼-sheet pan with coconut oil. 3Drain almonds and dates, place in a food processor, and pulse a few times to roughly chop. 4Add the remaining ingredients (dried cherries through sea salt) and process until mixture comes together, scraping down sides as needed. 5Spread onto sheet pan greased with coconut oil, pressing mixture evenly into pan. 6Refrigerate for 30 minutes to set before cutting. 7Cut into 10 bars and place on dehydrator trays about ½-inch apart. 8Dehydrate 12-15 hours, depending on desired crunchiness. If you don’t own a dehydrator, set your oven to the lowest temperature possible and bake until desired crunchiness is reached. Technically the bars are raw if they are “cooked” under 110 degrees but they will be nutrient-rich and delicious either way. The amount of time in the bars spend in the dehydrator will vary. The more humid the climate you live it is, the longer time it will take to dry food. If you want a softer bar, check the consistency after 8 hours. If you want a crunchier bar leave the bars in for several more hours.